A mini-tower UPS with line interactive topology. 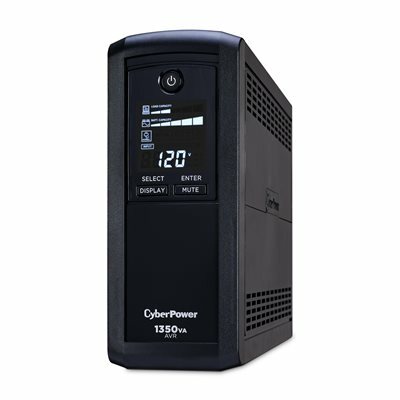 The CP1350AVRLCD uses Automatic Voltage Regulation (AVR) to correct minor power fluctuations without switching to battery power, which extends battery life. A mini-tower UPS with line interactive topology. Provides battery backup (using simulated sine wave output) and surge protection for desktop computers, workstations, networking devices, and home entertainment systems. The CP1350AVRLCD uses Automatic Voltage Regulation (AVR) to correct minor power fluctuations without switching to battery power, which extends battery life. AVR is essential in areas where power fluctuations occur frequently. Supplies up to 810 watts of backup power. Automatic voltage regulation (AVR) ensures that all your electronics receive clean power at a safe voltage level. Widely spaced outlets accommodate transformer-based plugs. 8 outlets let you power your peripherals, too. 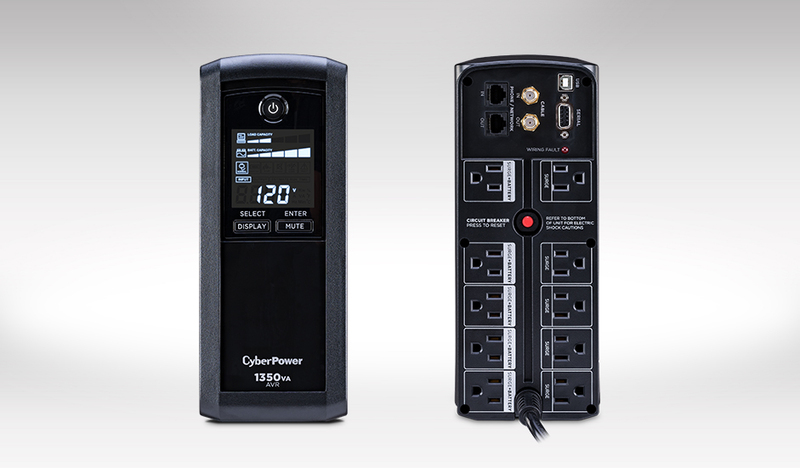 4 of the outlets provide both battery backup and surge protection, while the remaining 4 provide surge protection only. Provides surge protection up to 1500 joules. Shielding protects against electromagnetic interference and RF noise. GreenPower UPS technology helps reduce energy consumption. Can significantly reduce UPS energy costs when the incoming AC power is clean. It can also reduce heat dissipation and system noise. Includes software for controlled shutdowns. When power is lost, PowerPanel PE™ Management software automatically saves and closes any open files, then shuts down the computer system in an orderly way. Compatible with Windows 2000/XP/Vista/Server. Full dataline protection. Provides protection for RJ-11 and RJ-45 connections (to phone, fax, Ethernet, network, DSL), and RG-6 coaxial line (to cable modem, satellite or cable TV). This product comes with a with a $500,000 connected equipment guarantee. See user manual for details.